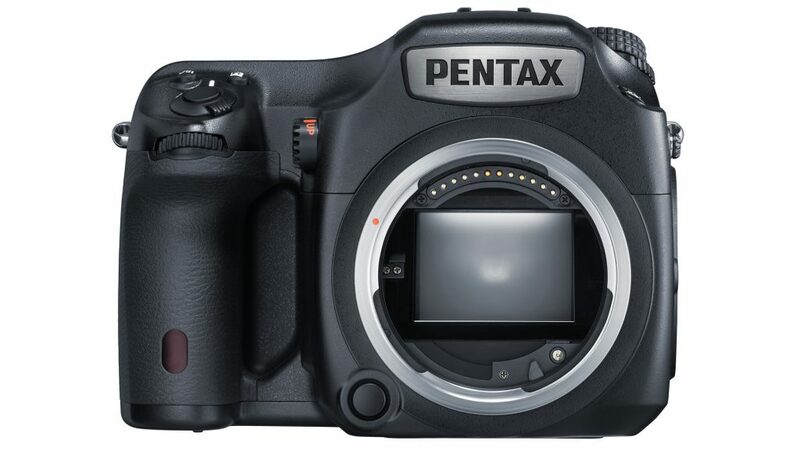 Announced in April 2014 as the replacement to the 40-million-pixel Pentax 645D, the Pentax 645Z is a medium-format DSLR with a Sony sensor that measures 43.8 x 32.8mm. With 51.4 million effective pixels, the CMOS chip produces 8256 x 6192-pixel images that make 27.5 x 20.6-inch (69.9 x 52.4cm) prints at 300 ppi. There’s no optical low-pass filter over the sensor, but there’s a Color Moire Correction option for JPEGs in the menu. Unlike some medium-format cameras, the Pentax 645Z’s sensor is integrated into the camera so it can’t be changed or upgraded with a different back. However, the camera has the look and feel of an overgrown 35mm or small-format DSLR, with weatherproofing and dust-proofing that makes it more at home in the field than some other medium-format models. At this time of writing, the 645Z’s pixel count is beaten only by such digital backs as the Phase One IQ3 (which is available with 50, 80 or 100Mp) and the Hasselblad H6D-100c. 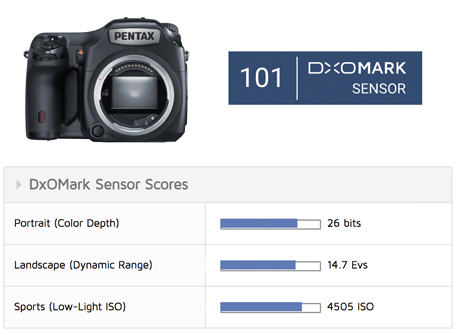 With an overall DxOMark sensor score of 101 points, the Pentax 645Z has the second-highest-scoring sensor we’ve ever tested, beaten only by the 51.4Mp Sony sensor in the Hasselblad X1D-50c. As you would expect with such a high overall score, the 645Z’s sub-scores are extremely good, indicating that it’s capable of capturing a huge range of colors and tones in a single file, while noise is controlled well. A Portrait (Color Depth) score of 26 bits and a Landscape (Dynamic Range) score of 14.7Ev are both very good, and that means that there’s plenty of data available for post-capture adjustments, so neither posterization nor banding should be an issue with “normal” levels of image editing. One of the advantages of a medium-format sensor is that the photoreceptors (aka pixels) can be made larger than they in a smaller device with the same pixel count. This extra light enables the sensor to produce a stronger signal that requires less applied gain, so images should be cleaner. This is borne out by the 645Z’s high Sports (Low-Light ISO) score of ISO 4505 — the highest value we have recorded to date. In this section, we’re going to compare the Pentax 645Z with the Hasselblad X1D-50c and the Nikon D850, our three top-scoring cameras to date. As it has a very similar Sony sensor, the Hasselblad X1D-50c is a natural competitor to the Pentax 645Z. And while the Nikon D850 has a smaller sensor, it has proven very popular thanks to its two-in-one camera that combines high resolution with an impressive autofocus system. Interestingly, it’s the Nikon D850 that has the advantage for Portrait (Color Depth), along with a very high Landscape (Dynamic Range) score, but it lags behind the Pentax 645Z for Sports (Low-Light ISO) by around 0.8EV, indicating that noise is more of an issue for the full-frame Nikon camera when light levels fall. The Pentax 645Z and Hasselblad X1D-50c compete very closely, but the X1D comes out on top, thanks to its slightly better Portrait (Color Depth) score. Now we’ll take a closer look at how the Pentax 645Z compares with the Hasselblad X1D-50c and the Nikon D850 throughout the RAW file sensitivity (ISO) range. 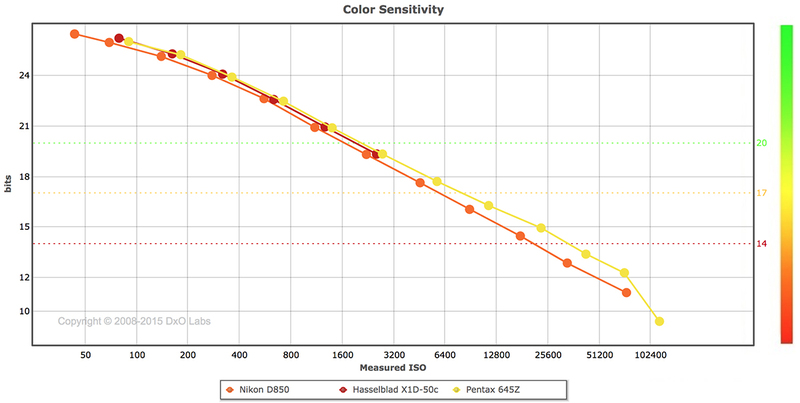 This graph illustrates where the Nikon D850 wins for Color Sensitivity — that is, at the lowest ISO setting. Once you push the sensitivity (ISO) above that value, it actually drops very slightly behind the two medium-format cameras. Nevertheless, if you want the highest possible Color Sensitivity, the D850 is the one to go for among these three cameras. Of the two medium-format cameras, the Hasselblad X1D-50c is very slightly better at the lowest setting. Looking in-depth at the color response reveals that although the Pentax 645Z’s sensor is very good (and very similar to the Hasselblad X1D’s), it can’t match the D850’s sensor for reproducing red and green. This is unlikely to be visible to the human eye, but the 645Z’s files could prove a little more limited when they are edited. All three cameras have a dynamic range of more than 14EV at their lowest sensitivity setting, which makes them ideal for shooting high-contrast scenes such as landscapes and weddings, where subtle tonal variations are very important. Further good news is that none of the three cameras drops below our 10EV cutoff for good image quality until their sensitivity setting is pushed over ISO 3200. This could be useful for low-light photography, but in reality, most medium-format photographers are likely to keep sensitivity as low as possible and use either long exposures or flash to maintain their camera’s advantage. 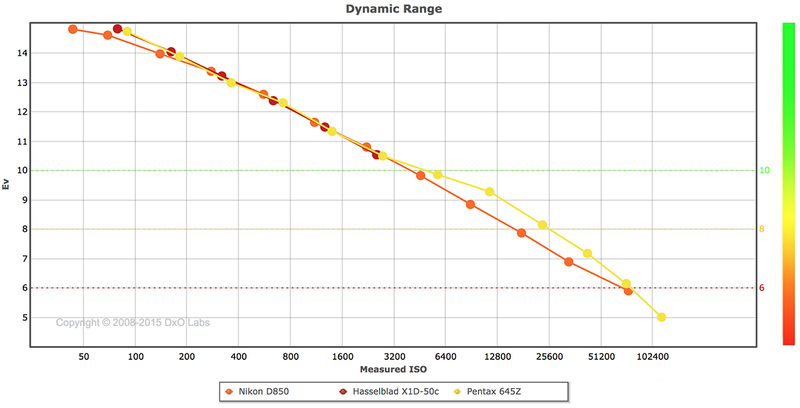 At most of the higher sensitivity values, the Pentax 645Z has an advantage of about 0.5EV over the Nikon D850, which is explained by the 645Z’s bigger sensor. However, given the significance of the size difference, we might have expected the medium format camera to do even better, which is indicative of how far sensor development has come in the three years or so since the 645Z was announced. Again, the two medium-format cameras’ sensors beat the small-format sensor, but for much of the sensitivity range, the D850 is less than 1EV behind, which again underscores the development in sensor technology since the Pentax and Hasselblad cameras were introduced. It’s also worth remembering that photographers don’t tend to buy medium-format cameras for their low-light capability, but rather for achieving the highest possible image quality. With this in mind, the Pentax 645Z should be used at ISO 800 or lower, but it drops below our 30dB cutoff only when it’s pushed above ISO 3200. Even then, we wouldn’t classify the image quality as bad until around ISO 51,200, which opens up the scope for shooting in low light. It’s clear from our testing that the Pentax 645Z’s sensor is extremely capable, coming within a whisper of matching the performance of the Hasselblad X1D sensor (our highest-scoring sensor to date). The 645Z’s high dynamic range and color sensitivity make it ideally suited for capturing the types of scenes that are traditionally favored by medium-format photographers — landscapes, weddings, portraits, and still lifes (commercial). Medium-format shooters are usually interested in capturing images with lots of detail, low noise, and smooth tonal gradations. In addition, the Pentax 645Z controls noise well, making it suitable for use in relatively low light, and perhaps expanding the range of conditions in which medium-format cameras are traditionally used. 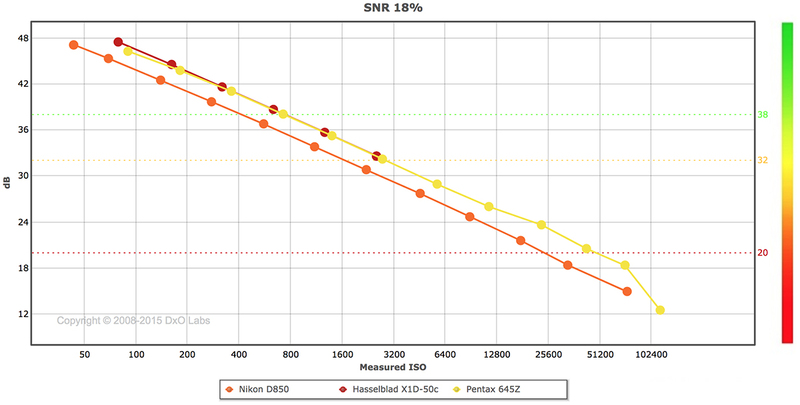 It’s interesting to compare the Pentax 645Z sensor against the Nikon D850’s because although the former is about 1.7x larger, it’s also around three years older. While the 645Z beats the Nikon sensor in our tests, the Nikon comes closer than you might expect, given the size difference. If Sony made a medium-format sensor with the same design as the D850, it would beat the sensors in both the Pentax 645Z and the Hassleblad X1D-50c. In this review we have compared the Pentax 645Z sensor to its most direct rivals from other brands. As usual, you can create your own comparison and in-depth analysis using our interactive image sensor comparison tool.